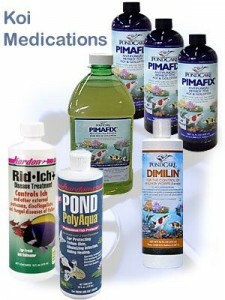 Pond Parts carries an extensive line of quality products for ensuring the health and vitality of your koi. Please feel free to contact us should you have any questions regarding the proper selection and application of these products. Attention should be paid to the quality of water and balance of the pond. Be aware of your Koi's behavior patterns so changes can be detected early. A change in your Koi's behavior is usually the first sign that that your Koi are stressed or ill.
Pond Parts carries an extensive line of quality products for ensuring the health and vitality of your Koi.